Perform a safety audit along KY 536 from KY 2856 (Riddles Run Road) to KY 338 (East Bend Road). Install low cost safety improvements such as curve sign upgrades and high friction surface as recommended in the safety audit. 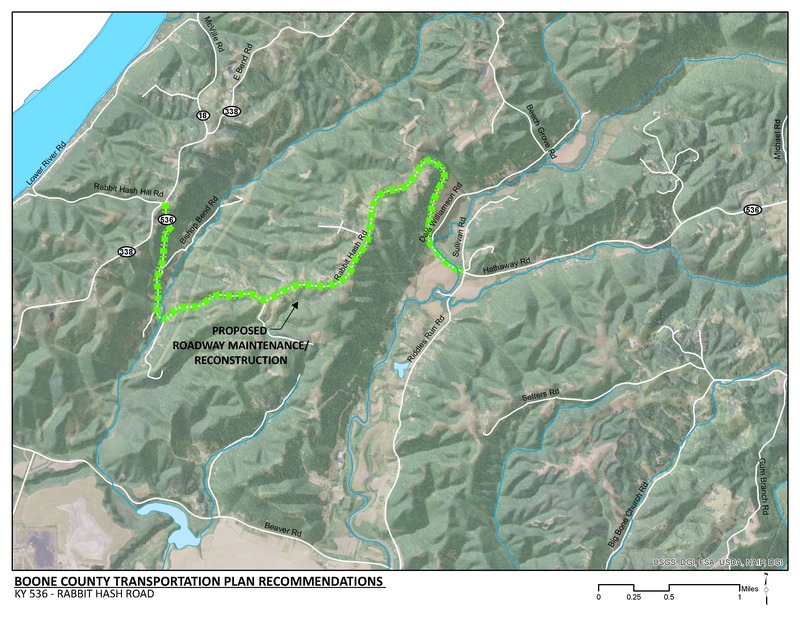 Improved safety along KY 536 for both vehicular and truck traffic. This project will need to be coordinated with KYTC’s Highway Safety Improvement Program that is administered through central office. This project may be funded through federal safety funds. This program promotes safety improvements that are within the existing right-of-way. If this type of funding is used, the project will need to comply with the requirements of the program. In the project area, KY 536 is a rural roadway that serves western Boone County. KY 20 is a scenic route for motorcycles that ride to the historic Rabbit Hash General Store. The crash rate of KY 20 within the project area is 2.5 times higher than the statewide average crash rate on similar roadways. Curves, lane widths and shoulder widths are not compliant with current standards as presented in the “Policy on Geometric Design of Highways and Streets” by the American Association of State Highway Officials. The Boone County Transportation Plan was conducted by the Ohio-Kentucky-Indiana Regional Council of Governments at the request of the Boone County Fiscal Court.